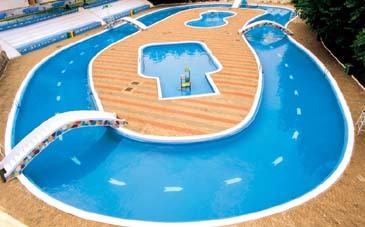 Sheraton Grande Walkerhill's outdoor-pool, ‘River Park', will open from July 1st to August 27th , for the summer season. To meet the demand and provide additional relief from the peak summer heat, River Park will remain open during the evening from July 27th to August 15th , a first amongst the five star hotels. In addition to the extended swim hours, guests will now be able to enjoy various sights and unique events at River Park, such as night concerts and bikini fashion shows. River Park is renowned for its excellent facilities and large scale of operation, offering a main pool, youth pool with a 5km flow (the speed of the pool's constant current) and a child's pool for little children (ages infant~5years old). This year River Park has been renovated to feature a Scandinavian design concept, providing the perfect family vacation spot that is comfortable, classical and natural. To enhance the beauty of the setting, we have introduced a transparent fence surrounding the facilities so that you may fully enjoy the spectacular views of the Han River without any obstruction. Let River Park, with its day and night entertainment, provide you and your family with special memories of this summer.